Detroit Lions 2010 NFL Preseason Picks - NFL Odds and History Are Against the Lions: Has any NFL franchise been a worse NFL pick than the Detroit Lions in the past decade? Unfortunately, long-time Lions’ fans know the answer and the Vegas odds makers are predicting more of the same disappointing NFL picks for the team in 2010, posting 40-1 NFL odds against Detroit making it to Dallas, and 100-1 NFL odds to win the Super Bowl. The Lions have much less loftier goals, however. For a team that finished 2-14, the goal would be to stay competitive as the 2010 NFL picks season gets underway. The Lions have had the worst defense in the NFL for the past three years so improvement on “D” is a must. To that end, the Lions rebuilt their defensive line in free agent Kyle Vandon Bosch, trade acquisition Corey Williams, and top draft pick Ndamukong Suh. The back of the defense is in flux, with only linebacker Julian Peterson as a lock to be in the lineup in the Detroit Lions opening day NFL Picks matchup against the Chicago Bears. How jobs are sorted-out will tell how this defense responds in the 2010 NFL picks season. The Lions have a franchise quarterback in Matthew Stafford and one of the best receivers in football in Calvin Johnson. That’s not enough, though. The Lions only have one legitimate linemen on the team in Jeff Backus, and the running backs are pedestrian at best, though the Lions are hoping rookie first round pick Jahvid Best will supply a boost at this position. 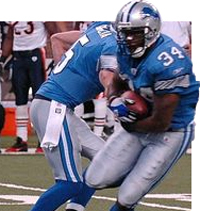 The Lions did acquire wide receiver Nate Burleson to provide a running mate for Johnson. The Lions have only won two NFL picks matchups in two seasons, going an astounding 2-30. How much the Lions can improve is a large question mark. The opening line on NFL picks victories in Vegas is five so any NFL prediction could start there, and, frankly, the Lions’ management would be thrilled with a 6-win season. Can the Detroit Lions finally earn some respect this NFL picks season from the Vegas odds makers? Make your 2011 Super Bowl Picks & 2010 NFL Picks at Sportsbook.com and receive a $100 No Hassle Signup BONUS.